Apz is a premium WordPress theme from WooThemes designed to promote or sell applications / products online. This theme will show the features of your app in a featured slider, and also make it possible to promote it further via the modular homepage layout. 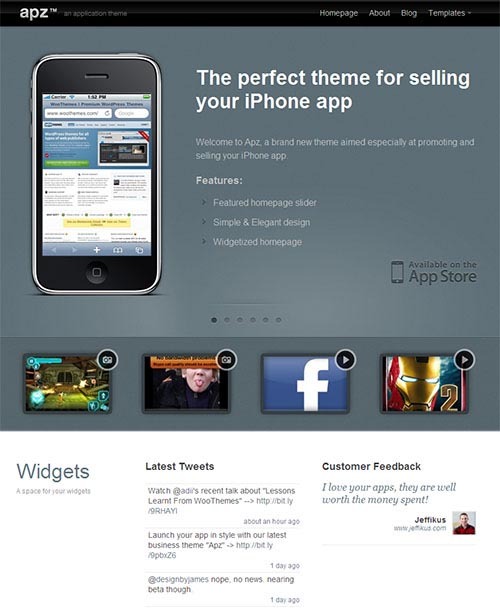 The theme features 10 alternative colour schemes, featured slider, custom widgets including a “Customer Feedback” widget, theme options panel and much more. A custom home page featured area to showcase your noteworthy blog posts. The slider is tag based so can include posts across numerous categories. A featured slider that can show screenshots from your application in an iPhone frame (or without frame). Easily add a link to Apple App Store on your slides via our custom settings panel. Show the features of your app with either image or video in the features area below the slider (optional). Custom Woo Widgets for use in the widgetized sidebar and footer regions: Post Tabber, Video, Twitter, Blog Information, Ads & Search. 10 delicious colour schemes to choose from. Option to change color of links and buttons in options panel. Also, it supports WooThemes exclusive features as well as standard WooThemes features.